I found Stephanie because she designs BEAUTIFUL fabric for Moda. Please check out her website! I get these beautiful and inspiring meditations, called Small Sweet Steps, e-mailed to me daily. This is so true. Sometimes we have so much on our mind, that one more thing may be too much to handle and we feel like we might explode. The nights we lay in bed before we submit to sleep, quickly reviewing our to-do lists and time schedule, along with our family's schedules for tomorrow and the rest of the week, debating whether we will have enough milk for breakfast the next day or enough bread for lunch, what we need to pick up from the store and whether it can wait one more day, and finally, if we are forgetting anything. Then we start playing over this list one more time, partly to memorize it and partly to check if we are forgetting something. Suddenly we aren't so tired, although we're exhausted because we don't get enough sleep. We rub our eyes wearily, and turn our head slightly to the right with our eyes closed, and think "Please! Please! Please!" before we peek open an eye to reveal the time. It goes one of two ways. The best scenario is when a giant smile allows a satisfied sigh escape as we turn over knowing we will get at least six hours of sleep tonight. Or it could go the other way. An exasperated groan of disgust for that stupid clock, as we turn over with our back to the clock and we count how many minutes of sleep we could get if we fell asleep immediately, but knowing it's not going to happen that way. Sometimes other thoughts will haunt us at night as our bodies start to relax and prepare for slumber. There are buried secrets, hopes and dreams, along with reality's bills, problems, strained relationships to think about. Last Monday many of us went to sleep, terrified what tomorrow will bring, or if we will even wake up in the morning. Our definition of safe is constantly growing smaller, while the terrorists are stealing it away in bigger plans with no regard for innocent human life what-so-ever. We go to sleep understanding that it didn't change anything the terrorists hoped to accomplish. We go to bed with tears trickling down our face, thinking about a father who lost his 9 year old son, his daughter's leg, and possibly the personality and normal functioning of his life partner. Not to mention all the others who were hurt physically and psychologically forever from this event. Tomorrow we have to watch our children get on the bus, and it's so painful to think that something could happen to them, we gasp for breath and the tears are streaming down our face now. We know our children will grow up and go out in the world. And we are terrified what the world is going to be in ten years, if this could happen in the world right now. And while everyone probably does this a lot, and that's ok, but it's also ok to cut off the thoughts, by just relaxing by breathing. The best way to prepare for tomorrow, is by writing a quick list before you go to bed, and try to cut those thoughts off and turn your mind over so you can sleep. I know I used to waste a lot of valuable Sleep Time worrying about what I had to do for tomorrow. If you just breathe, and allow your mind to slow down, it becomes easier to think about, because the stress is removed from your body. When you are stressing about something, you begin to breathe faster and that doesn't allow oxygen to get down into the bottom of your lungs where most of the oxygen exchange happens. You start to breathe a lot of recycled carbon dioxide, which makes you breathe faster. It's hard to relax because your body needs more oxygen, and you don't even realize it, because your body is already compensating for it. If you take 3 deep breathes, it allows your lungs to become fully filled with oxygen, and your brain recognizes it, and hormones are released so you will start to relax. If you don't believe me, then try it next time you are worked up. You will be able to focus clearly on the problem. The correct way to deep breath is to breathe through your nose, while counting silently in your head up to 5. Then you hold your breath for 5 counts. Then you slowly let that breath out of your mouth, just like you were blowing out a candle. for 5 counts. If you can do 5 counts, then do 4. ***The important thing about this exercise is that you do all three with the same number of beats*** The most difficult is slowly releasing your breath out of your mouth. You will want to release your breath as if you were sighing very fast, but the correct way to do it, is to slowly release it. The method is used for anxiety. And if you practice it enough, it will help. The next time you are about to triple-check your mental list, try doing a few deep breaths instead. It will clear your mind, and the dark room will make it known your brain that it's ready for sleep. You will get enough sleep for the next day, and you will stop hating your alarm clock so much. This also helps when you are at the bank or grocery store, when someone is trying to stand on the back of your heels. JUST BREATHE! It helps when you are driving in the rain, or when you are having a heated discussion, and you want to reconsider what you are about to say before you blurt it out. JUST BREATHE! I promise this tool is life saving! And it always reminds me of the song "2 am" by Anna Nalick. Check it out on YouTube if you have never heard it. It's a powerful and moving song. As I write this, I'm watching the horrible explosions at the Boston Marathon. It's so sad. I can't wait to find out what they figured out what happened. Who/What/Why. I'm not being funny, but you can see all the emergency officials, police, army, and then you see all the athletic running jackets. The volunteers were running back and forth with wheelchairs. At least this happened where Americans were healthy enough to help other people and to run away during the evacuation. It looked like chaos for a minute or two until I was able to focus with the jostling cameras, but it looks very organized and that's great when an emergency like this happens. There is a lot of blood on the side of the road. I saw some people and policemen lift a wooden barrier (that looks like a fence with the pointed ends that go in the ground) off 6 or 7 people laying on the ground. This happened in an area with 500,000 people. So crazy. I hope this isn't terrorist related. I'm already scared to death about North Korea. So, I haven't perished, but my computer has been giving me major problems lately. I wasn't even online for 3 days. I think I figured some things out, and hopefully it will settle down and do it's job from now on. So I HAVE to make up for lost time. 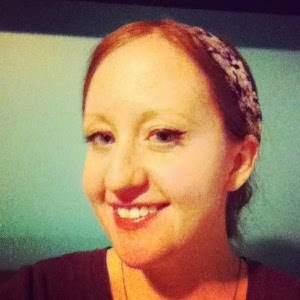 You are going to see 5 Influenster posts that I have to make up. I have lots to share this week. AND I'm going to finish those damn blog prompts next month. I have missed a week's worth of prompts. I really like this picture. It was taken a week ago from Friday? Yeah, that's about how long I've been without posting. I've also researched how to take better pics with my iphone. They look AWESOME on my phone and when I put them on the computer they look $hitty. This is the Instagram version of this pic, and I liked it better, although it looks like I'm missing eyebrows and colored them in with a green crayon. But I really like eye makeup. But today's the last day to file taxes and I waited to the last minute just for fun, so now I'm going to do that. An update of 22 injured and 2 dead. My thoughts and prayers go out to everyone in Boston and the families of those who lost their loved ones. Day #6 Finally Caught up! Day 6: What is the hardest thing you have ever experienced? I'm going to say the hardest thing I've ever experienced was watching my sister get sick with cancer, and eventually dying. I don't really think I have to elaborate on this one that much, because it's quite obvious why this has been the hardest. I've gone through many hard things in my life, sometimes I think more than one should already in one life time, but this one definitely is Tops. I'm not much in a mood to go on, so I'll just find a picture instead. Hope everyone has an awesome weekend!!! This was from Sept 09. 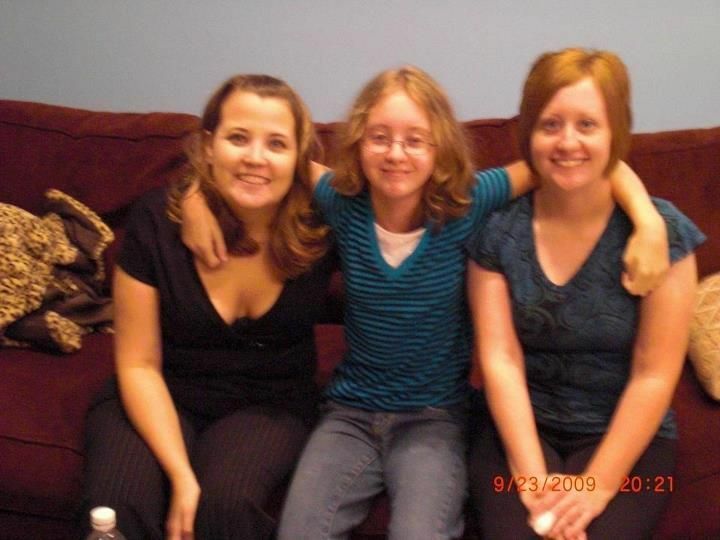 L>R: My sister, Angie, my daughter Ashley, and Me with a bad hair day. Bad Pic from my Dad's 50th Surprise Bday Party. Me & Angie. She's younger AND taller! On my sister's surprise 29th Bday (her last), June 27, 2010. She passed Aug 7, 2010. Day #5 in 30 Days of Blog Prompts-Almost caught up!!! Day 1: List 10 random facts about yourself. Day 2: Describe 3 legitimate fears you have and describe how they became fears. Day 3: Describe your relationship with your parents. Day 4: List 5 things you would tell your 16 year-old self if you could. Day 5: What are the 5 things that make you happiest right now? Day 7: What is your dream job, and why? Day 8: What are 3 passions you have? Day 9: List 3 people who have influenced you, and how. Day 10: Describe your most embarrassing moment. *The first third of the 30 Days of Blog Prompts List* See the rest, here. 1. My Daughter. She will always be the first thing! 2. Fabric. I LOVE fabric. Looking at fabric on the Internet. Sewing and Quilting blogs. 3. My Pets-Izzy, Mr. Smuckers (my late sister's cat), and Boomer. Izzy is *my* cat. She's a Flame Point Siamese. My ex bought her for me for my bday in 2009 from PetSmart. I hate to admit this, but I threatened to break up with him if he didn't, haha. He believed I actually would though! I was just pouting, and I don't think he experienced a totally selfish desperate girl pouting before! Haha. -Mr. Smuckers was bought as a kitten, and he is a Himalayan. He is SO beautiful. He moved in with us when my sister moved here and hasn't left since. I used this time to bring Izzy to my parents house, because she lived with my boyfriend. I was freaking out because he was moving and she wasn't going to be allowed to go, so having Mr Smuckers here, was definitely helpful for me to keep Izz, because my parents were set dead against it. -Boomer is a Jackapoo. He is a Jack Russel/Poodle mix. We got him in November 2005. I love him because he can sleep all day without having to be let outside to use the bathroom. When I worked midnights, this was really important for me to be able to sleep. He is always 5-10 pounds overweight no matter if he's on the strictest diet with a lot of exercise, or if he's eating everything in sight. 4. My King sized bed with 6 Ikea pillows and down comforters. I love my bed so much! 5. My 50" Plasma TV in my bedroom. As I've mentioned before, I'm participating in 30 days of blog prompts. Last week my computer took an entire day's worth of energy to reload/fix. Another day, I spent getting used to my new med switch, so I've been behind two days. I have NO IDEA why I didn't write some of these before hand, and schedule them so they would be on time. Oh, well. Live and learn. Here's the first third of the list. You can see the whole list here. 1. High School doesn't matter. Ssshhh. Look at me. High. School. Doesn't. Matter. Yes, that's right. It doesn't matter. I heard something last night, that I could really relate to that my friend said. She said that she used to think that she could be Happy, if she could just be This Person. This Person was always someone prettier, smarter, popular, had tons of friends in all the cliques, and someone you just knew that you would be happier as. I remember thinking this as far back as 4th grade. I was picked on starting in about the 5th grade with a few boys, super picked on in Middle School, and the teasing stopped at the end of 10th grade. It was about then that I participated in laughing at and making jokes of other people. I have no idea why the kids I went to school with were mean. But if you didn't laugh at other people, you quickly became the next target. I can proudly say I'm not like this anymore, and would definitely be on that show where they see if people would speak up or not. Because I rarely don't stick up for something I think is right. After high school, I became prettier, had more friends, became smarter, cared about things in the world going around me, and just finding myself and not caring what other people think. I have a few friends left that I would consider friends from High School, but not many. I didn't go to any of the proms, dances, or had my senior pictures taken. And I don't regret not doing those things. Even though I had tons of cute clothes 10 years ago, the 15K worth of credit card debt that I entered into a debt management program in 2003 wasn't worth the pain of having Bad Credit. A year before my original graduation date, I started charging a lot on my credit cards with the promise of "paying it back as soon as I graduate". Because LIFE NEVER GOES AS PLANNED, I am paying off the last 2K of that debt still today. I've probably payed more than double in interest. I used my cards for gas, food, books, and anything any time I didn't have cash on me. I was paying the minimum due, because I was too busy with life, than to responsibly sit down and balance my check book. 3. Life NEVER goes as planned. I never though I was have the disease I do, have a teenage pregnancy, switch my major with 3 semesters left, lose my baby sister to Cervical Cancer before she was 30, or thought I would live with my parents AFTER the age of 30. 4. Ask for help when you need it. Don't rely solely on other's opinions of what you should do. Do what you think is right for YOU. I should have been more confident in myself instead of listening to others who also didn't know what the hell they were doing. EDIT: This post did NOT post when written and saved as draft. Sorry for the out-of-order-ness! This is hard because I'm just going to get really honest. 2. Relapse. I have "resigned" from two jobs because of my opiate addiction. I'm in a special program that oversees my recovery to make sure I'm safe to practice as a nurse. I've been clean and sober-not a drink, not a pill, no cough syrup, nothing that contains alcohol-which is food, cleaning products, hand sanitizer, or beauty products, no sleeping pills, no caffeine pills-for over 2.5 years. It will be 3 years in July. 3. I'll lose my daughter. This is an irrational fear. This may be because I lost my sister. If I lost Ash, I don't know what I would do. I would feel so horrible and bad, I think I would be heartbroken and lose the desire to live. Especially if she was murdered. Sometimes my thoughts race about this, and I cry. I couldn't imagine losing her. I feel like I already lost my sister, than maybe I'll be safe from losing my daughter. But realistically, anything can happen to anyone at any time, and life from there on is different. What if she got into a car accident and wasn't able to communicate or talk again? My heart hurts SO much when I think about this stuff. So those are 3 of my fears. They can be really intense, especially the 3rd one. Day #3 Blog Prompt-Catching UP! I'll start off saying I have SO MUCH appreciation for my parents, because they have supported me with everything in life. They have been married for almost 35 years. It's not always the best relationship, but we all love each other. When I was 17, I had Ash. They allowed me to bring her home and raise her, if I finished High School (which I didn't even consider NOT doing). The bad thing about my life, is that I have EMBARRASSINGLY always technically lived with my parents. There was a time when I dated Ash's father (again) and we were over his house or up north with him a lot. There was no way I could afford to live a comfortable AND safe life with Ash by myself while going to school full time and working full time. She would have to get up extremely early for school, and be picked up at midnight. So we have always lived here. My sister got sick, and she eventually moved back home. She was in the hospital most of that 2 years, so it felt like my parents were never home. When I got clean, they let me come home after rehab (I was technically kicked out at that point), and they have been extremely supportive in my recovery. So my goal is to work the next few years, pay them back, and put a down a deposit on the house. I wouldn't have anything I have now without them helping me, and having them refuse to help me in other areas so I would help myself. My life is a lot different than others, and I just have to be accepting of that fact, not compare myself to others because most people won't have the same experiences as mine. Spring always makes me more happy!!! I have a lot to do! I'm starting my 30 Days of Blog Prompts. My first day was posted back in March, but I will be starting Day 2 tomorrow. If you want to see the list, or join me, check out The List. Last summer, a ton of people participated in a blog hop that featured projects out of the Zakka Style book. Zakka is a Japanese term that means "many things" and it's about the little things that improve your home and space. The book had 24 projects, and different bloggers presented a tutorial. THIS year, a new book called Zakka 2.0: Patchwork Please!, written by Ayumi Takahashi, was just released, and Ayumi and 19 of her blogging friends will be doing another round of Zakka. I'm excited because I just started the blogging world last summer, and I remember all the cute projects everyone was doing! This year I will be participating! YAY! If you want to check out what kind of projects Ayumi makes, her blog is called Pink Penguin. You can check out the details at Lindsey's blog: LR Stitched. The book is set to ship April 9th, although Amazon says you can get it by Wednesday. The book retails for $22, but is going for $14.20 at Amazon right now. I'm really excited, because this is the stuff I want to do! Some other stuff I'll be working on, is my Influenster products, so bear with me ;) I know seeing the same thing in Blog World can be boring. I hope everyone had a great holiday weekend and an awesome April Fool's Day. Anything I think would be really funny, would be really inappropriate, so I'll be staying out of the festivities this year. I just checked out her tutorial and it gives me a lot of ideas! I think these are obtainable! FOR FUN. This is my Best Friend who works at a certain restaurant in Ann Arbor, and in January THAT GUY came in and got his picture taken with Dogg. I didn't believe him because he tells me ridiculous stories that NO ONE should believe, but he gets me 75% of the time. Another thing about this pic, is that he has lost SO MUCH weight in 3 months. I resemble a stump that can't lose weight. But I'm gonna do it! I'm almost 120, and I can be happy at 109. I used to weight 103, so I think it's a good middle point to aim for. I'm 5 feet, so don't judge my numbers. If we did proportions my 10 pounds equal 25 pounds on you!! My body decided to not work with me when it hit 30. You hear the Horror Stories, but you don't think it will happen to you. you think, whatever, I got this. BUT YOU DON'T. I was in a major denial, and then I hit 30. Whatever genes make it hard to lose weight, also crave chocolate in a major way.